You’ve said The Blue Moon Book is hard to put into a sound bite. Why do you say that? As a reader when you start the book you don’t know anything about Jess’s background. There’s strangers in a hotel room who have discovered a level of empathy and harmony of spirit and intensity of attraction that most people will recognise as something that can happen in life and whose consequences are unknown. Because Jess has an accident, and a large part of the book unfolds around her, questions about the identity of relationships in which she is a key figure are raised. In medicine you must have observed people having these sudden, abrupt changes in their lives, in themselves, physically or mentally. This is a fascinating way to approach a feeling of uncertainty. It’s an issue of identity I’ve always been concerned with. Jess’s dilemma is that nobody’s quite sure who she is. They’re working to find out who she is and who they are in relation to this person whom either they haven’t known, or who has changed so greatly that they don’t necessarily recognise themselves in her or her in them. It creates a slightly heightened tension, the same thing that happens to all of us every day in life. There are always uncertainties in how we see ourselves and how other people expect us to be, and that’s partly what makes life so wonderfully varied and colourful, quite apart from possibilities of sadness. I found Dan a very interesting character because he actually makes changes in himself. He’s his own worst enemy, and you can see he’s held back by his own faults. He’s selfish, jealous and possessive in some ways. He can give but he can’t take, he’s his own worst enemy and a complicated man. But you are always aware of intimacy and tenderness as well as distance and coldness between him and Jess, and he emerges rather well from the book, as a decent person. When I sit down to write I don’t necessarily have a plot right at the beginning. It’s very character driven. I had this basic simple plot of an accident and disrupted relationships, but when I was writing I was never very sure what was going to happen at the end. Dan is just a very real character who grew into all the various discomforts of his role in the story, and who transcended the difficulties imposed by his uncertainty and his need of the reassurance of physical attraction and new physical conquests. He may still well be marooned in life, but in a way he’s probably lonelier at the end of the book than at the beginning. He’s not wholly resurrected as a character, but he has grown considerably. It’s interesting you say the book wasn’t particularly structured in advance. How does that work, to have an organic shape in your mind that isn’t necessarily consciously held onto? If I have a story that is too hard and firmly drawn together, it doesn’t shine or grow. I tend to let characters have their head a fair bit if it’s useful to the general feeling I have about the story. Sometimes it can change the direction of a story and occasionally you have to change a story completely. Dan grew in ways I didn’t expect, which I was very happy about. When you read the book it actually seems quite highly structured. It’s framed between two sections called ‘Beginnings’. The first is the accident itself, and the second is another real watershed moment in these people’s lives. The middle section describes all of these interconnected characters through their eyes – how many are there? Five or six. They’re the people who are close to Jess. We are all interplays, even if we have quite isolated lives, of different personalities and expectations and landscapes that we’re set in. And I love that. Landscapes that we’re set in? We’re set in landscapes of people and expectation. You have Ken from Orkney, and Sian, who’s from Glasgow but lives in Edinburgh. She goes on these wanders through what is to her a strange city, and she sometimes bumps into Dan, who is also from Glasgow, but he’s Irish. The end of the book is set in a fictional locality, but it’s very much a real Highland setting. The landscape is important in all those personalities I thought, but I wouldn’t have said they’re landscapes in terms of themselves. While I was writing, it was lovely to hear all the different accents. That’s not something you can put on the page necessarily. Ken’s Doric is a very lively thing on the page, but you can’t really put the nuances of an Irish accent or an Arcadian accent or a modified Edinburgh or Glasgow accent, but I was very much hearing them when I wrote it, and as I read it and reread it. It’s quite difficult actually writing a novel when you’re working nearly full time. I work two thirds of the time as a doctor in dermatology, so it’s quite a different area of medicine from the one I was portraying [in the book], so people working in that area will have to forgive me my interpretation of it. I obviously do as much research along those lines as I can, but in some senses I’m a layperson in these areas too. Every time I would come back to the novel, which would be Tuesdays or weekends, there was a lot of reading involved, and you were reading to get yourself back up to that point where you were writing again. You have to immerse yourself again, so you get the right atmosphere and the right mood and so you don’t forget any of the back story that’s already there. Maybe that gives you clues as to the original design for the story. It’s like a poem, sort of little colours that you’ve either knowingly put in or discovered in the first extracts that become more resonant. There is an interest in colour in this book: blue. Was that intentional? I think that’s an instinctive thing. If I’m trying to remember a colour of something I always say it’s blue. Like when they had these poster boards outside the natural history museum. I was sure they were blue, but they were green. I always remember blue. There is something about the colour blue that is so beautiful, it’s so tied in to light. There’s a transparency and an honesty to blue; romantic, I don’t know what. [Laughs] Colour is a visual stimulus, but essentially, the central aspects of life, the nuances of sound and smell, I think they’re wonderful for really bringing you into it, into the same environment as your characters. I think these kind of stimuli work in quite a subliminal way, very deep in the midbrain, hardwired things, not too conscious, yet they move you very much emotionally. There’s a lovely bit when Dan and Jess are eating oysters and discussing it, and you practically feel them going down. I think as an author you’re treating your reader as a friend, by giving them this friendly banter. And there’s a slight feeling that some readers will have a smile at a few moments, as you do when you’re having a gentle laugh with someone. Episodes like that are quite important to pace. When you’re reading you have to have the light as well as the shade, and there’s quite a bit of shade that these people in the book have to live through, so it’s nice to have that balanced by the warmth, the lighter, everyday pleasures of interaction. The banter is quite full-scale is between the ambulance staff. Oh they’re great fun! But they have to be. They have camaraderie. Some people might think that wouldn’t be allowed in a hospital, but I like to think that’s exactly how people behave in slightly heightened situations, just as they do when relaxed. I have such great respect for people like medics or casualty workers. They’re working with such high tension, they have to be so immensely professional, so incredibly good at what they’re doing, and yet somehow they have to remain human, alive and happy enough to go on to the next job, and go home after it. When you’re describing what happens to Jess, you never specify the actual injury. It’s obviously a brain injury as she’s being looked at by neurologists. People are working with her, she has a speech therapist and so forth, and you see her move from intensive care to a small ward and then a slightly larger ward, so you know there’s progress and she is regaining speech. But there’s no point at which you say what she had. You don’t get technical about it. I presume that’s a conscious choice? Yes. I don’t think you need to. I think if you actually had the scene where Dan was talking to the neurologist, you’d be much more specific. I considered that in sectioning and writing different areas of the story, but I don’t think it would help the type of story I was trying to write. These areas of brain injury people tend not to like to pin too firm a prognosis on because there’s so much possibility of recovery with any type of brain injury. At the beginning when Ken speaks to Dan we don’t get all the technical jargon – but Dan doesn’t get it either. When people get shocking news they often don’t take it in, and that was refracted through. I felt it carried an uncertainty which added to the emotional engagement. It felt more like a real, personal experience. I was very much trying to make it like that – not a doctors’ book. If you had a neurologist talking to a neuropsychologist about it they’d have quite a different sort of conversation and it would have been jargon, which wouldn’t have communicated very much to a reader. Whenever the characters get near any sort of scientific discursive aspect of Jess’s diagnosis, they tend to shy away from it, partly because they’re wanting to speak in ordinary terms. Sian and Henry try to discuss it at some stages in a more intimate way, but they shy off and go into talking about what’s actually happening to Jess, because that’s the important thing. 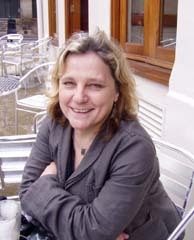 Sian, perhaps of all the characters, is the one who has more of an academic interest and perspective with what’s happening with words and story. When she’s talking about these things she’s actually chatting up Ken. It’s not too heavy there because you get the impression of Sian really not wanting to talk except that the language is easy and calming her down. You get that double ambivalent layer which happens so often in life, which I love. There isn’t a migraine-like complexity about things, but your book conveys that feeling of people, relationships, sort of shimmering. You could say it depends on the light – things take on different tonal intonations according to the lighting. Some people like each other, some people don’t, some days are good and some aren’t, people move together and move apart. You’ve mentioned previously that you were interested in a notion of medical narrative. What is that? I’m interested in narrative within the context of medicine because I work in medicine and I work with words. Working as a doctor you’re working with words all the time anyway. One of the things that really engages me as a doctor is understanding all the different layers and nuances of narrative that would underpin any simple consultation or any simple discussion that you and I are having just now. In medical terms there’s a wonderful new growth area where people look at language and the passage of life that we construe as medical, insult, injury, developments. The interaction between medicine and language can be looked at from anything to do with the words that you use when you’re talking to people, to the complexity of the story that you’re offering, to the types of research that you do in medicine, whether it’s very scientifically based, very based on numbers, kind of hard, apparently rational scientific construct, or whether it’s more holistic, more postmodern really. It is valid and valuable, the term ‘postmodern’. My understanding is that if you take the term postmodern, in literary critical theory, it implies that the meaning of the text depends on the person reading, hearing or in any other way experiencing it. It is exactly the same in medicine. You have to be very certain, when you’re dealing with a patient, to understand your role in the discourse. If you rule out all the patient’s narratives and assume yours have priority you’re not going to do very well persuading the patient to any sort of agreed onward relationship, never mind to the concept that your prognosis and then treatment are going to work. It’s something that medically I’m really interested about. I work with students and general practitioners trying to get them to remember that our story is just one of this wonderful interwoven canopy of stories that we’re experiencing in the clinic. So you try not to create hierarchies that will block understanding. Absolutely. And you may not be able to persuade the person who is seeing you that your story is the right one, but at least if you understand as well as you can where they’re coming from you’re going to be able to try and ofer them your version of what the best scientific narrative is. And you have to remember it’s only your version of the best scientifice narrative. But being in a job that straddles the arts and the science you have to work in both fields. And that’s one of the great pleasures of medicine at the moment, understanding that, and understanding that complexity of communication. It’s like Renaissance medicine. We’ve assumed from the 20th century that we have a hard and fast science, but you cannot ignore the ethical or philosophical or narrative world because we’re still operating within all these. There’s been a process of exclusion of women from the medical profession going back not just to the late 19th and early 20th centuries, with Sophie Jacks Blake and Ellie Ingalls, but even earlier with women who were burned or ducked and drowned as witches. These were often women who were involved in dispensing herbal or whatever medicines were at hand. I wonder if the new sense of the importance of sensitive and sharing narrative in the medical profession is connected to the relatively recent female presence in the field. There certainly are a lot more women in medicine now, in the last forty years. They’re gradually filtering through into the higher areas, and yes that changes how people are communicating, because we know men and women communicate in different ways, but hierarchies in medicine are still changing very slowly. The narrative in the medicine world has flourished in America for the last 20, 30 years. It’s men and some female anthropologists who have done a lot of the early work. The writing of Arthur Frank, for example, is fantastic. He’s a medical sociologist, and a wonderful storyteller. There’s a point at the end of the novel, a motif out of a fairy tale, that involves a kiss that awakens the princess, but I would have been unhappy as a reader had the book ended there. I was pretty fascinated by the fact that the idea of ending there was anathema to you. Nothing was lost from that moment – there’s something very special about the fact that your ending has nothing exactly categorical about it and ends on quite an odd note instead of the fairy tale ending. What exactly would you say is the note you were wanting to strike with the last sequence of your book, which you call ‘Beginnings’? I suppose if it ended with Dan’s phone call, you were left with a very strong note of his need for the relationship. And it’s still there a little. They’re real people you see, they’re not just characters. You know Dan is going to be in touch anyway – whatever happens between these three characters, it’s not going to be straightforward. And you want things to work out for Michael, because he’s been so steadfast and so loyal in all kinds of ways. And Jess – we aren’t seeing Jess very often in her full sparkly self, and she may never be that full sparkly self again, but she is left with distinct choices, distinct choices and strengths, so she’s grown as well. She will also know for the rest of her life, even assuming she got 100% well, that personality is provisional and ephemeral, and that’s one of the attributes of wisdom. I think they all have gained in wisdom by the end of the book. And that’s lovely. So it did have a fairy tale ending after all. The Blue Moon Books (£9.99 PBK, ISBN 1842820613) is available from Luath Press.